How to Avoid Blurry Photos in Digital Photography is very basic concept and the blur of a photo can not be corrected by editing. A blurry photo can do nothing but can appear like a mess despite your all efforts in composition and other points. We are not taking about the artistic Blur in Digital Photography, which is a fully different topic. How to Avoid Blurry Photos in Digital Photography means how to avoid the camera shakes which interferes with focused clean and clear image. 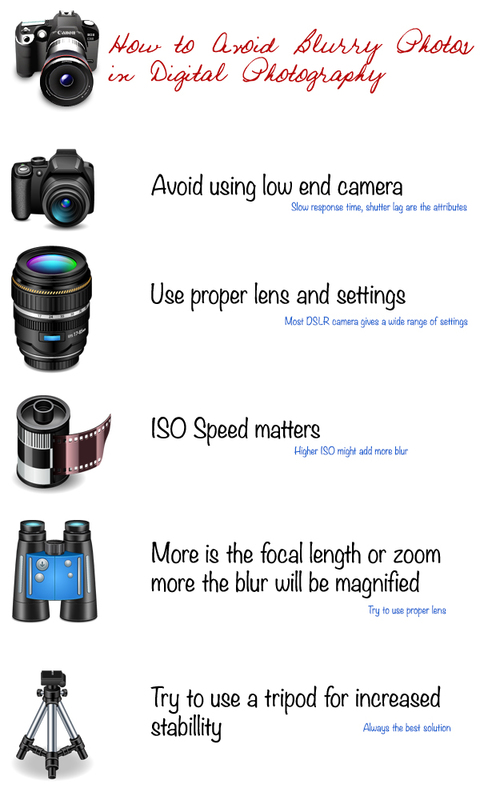 How to Avoid Blurry Photos in Digital Photography means knowing some points which makes the photograph hazy. Blur due to camera’s shake imposed by the Photographer. It is almost impossible to remain really stable when shooting. We will learn to detect camera shake and correct it. Blur due to subject’s movement is more complex and fully depends on situations and settings of your camera. The lack of focus can result in less sharpness in the right place or it is not at all sharp. Detect the problem and fix it. Discover some examples of situations in which it is often difficult to take sharp pictures. Before pressing the shutter button, you definitely need to concentrate not to move. But can we really stay stable ? Our simple breathing, the beating of our heart and the circulation of blood in our veins generate small movements, which we are not necessarily aware but we are moving. Unlike the blur associated with the movement of the subject, the image is completely blurred and not just the subject. This blur materializes in the form of streaks or kinds of ghosts, both for the subject and the background and causes a feeling of ghost image. Note that the higher the focal length is long (more you zoom) the slightest move will be highlighted or magnified. The world is in perpetual motion – children playing, sports, cars are in move, group portraits, wind in the trees. Except for the pictures of still life indoors, you will have to shoot a moving source. In addition, there is Shutter Lag specially prominent in low end digital cameras. The blur appears as streaks or long, instead of the subject. Only your subject is blurred, the rest of the image appears sharp. If the focus not been done at all, it is the whole image is blurry and needs no explanation. The solution are pointed towards understanding the basics of photography like f value, Aperture, ISO – all of which we have discussed before in this website. This Article Has Been Shared 3784 Times! DSLR Camera and Needed Accessories seems not heavy from the title but which accessories are must, which one should be added later have to be understood by the user. Cite this article as: Abhishek Ghosh, "How to Avoid Blurry Photos in Digital Photography," in The Customize Windows, February 2, 2013, April 25, 2019, https://thecustomizewindows.com/2013/02/how-to-avoid-blurry-photos-in-digital-photography/.